At the risk of being immodest, I'm comfortable with those concepts - Design Patterns from waaaay back and the functional paradigms from my five-year (and counting) love affair with Scala. What I wanted to explore was - what would happen if I built a React app by myself, endeavouring to write the cleanest, purest software based upon the best starting-point we currently have? How productive could I be? How long would it take to build a working full app? How would maintenance go? How quickly could I add a new feature? 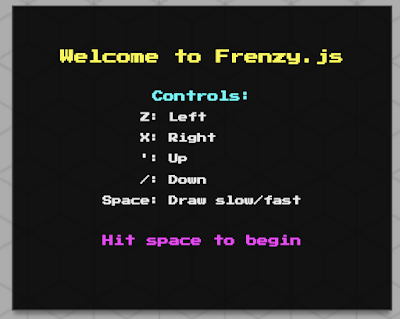 As my day job is basically building CRUD apps, I wanted to do something a lot more fun for this side-project. And what could be more fun than a game? (Mental note: ask people working at Electronic Arts...) There's also a pleasing circularity in building a game and documenting how I did it - back in my earliest days of having a computer, aged about 7, I would buy magazines with program listings and laboriously enter them, line-by-line, while marvelling at how anyone could really have been good enough to know how to do this. I'll admit, I've never built a non-trivial game before, but I think attempting an 8-bit home computer game I remember fondly from my childhood, on top of 2018's best front-end technologies, should be about the right level of difficulty. 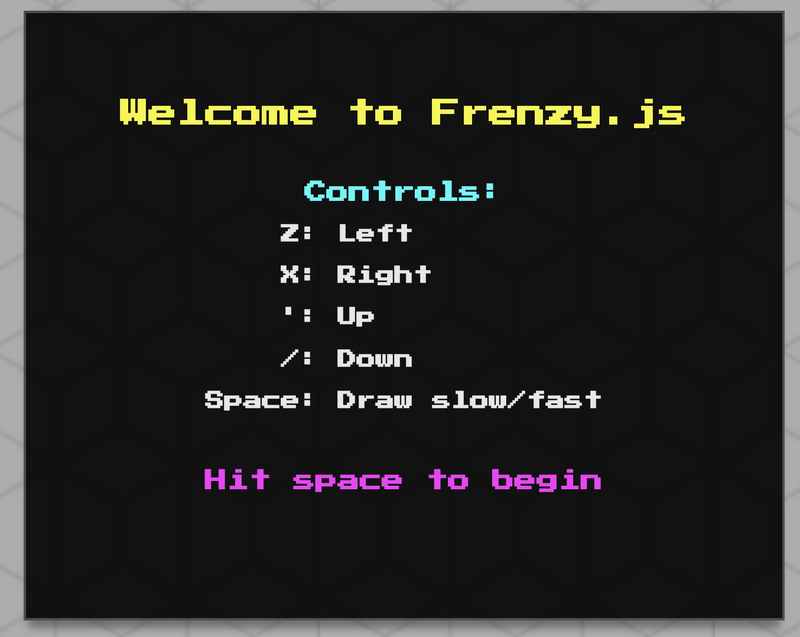 The game I'll be replicating is called Frenzy; a Micro Power publication for the BBC B, Acorn Electron and Commodore 64. My machine was the Electron - basically a low-cost little brother to the mighty Beeb; highly limited in RAM and CPU, titles for this platform usually needed substantial trimming from their BBC B donor games, despite using the same BBC BASIC language. Check out the links above for more details and screenshots, but the game is basically a simplified version of "Qix" or "Kix" where the object is to fill in areas of the screen without being hit by one or more moving enemies. I'm sure more will follow. What screen size should I be working to? Can I get a suitably chunky, monospaced font? Press Space to start sounds easy, but how do I make that actually work? The original Frenzy must have operated in the BBC's graphical MODE 1 because it used a whopping 4 colours and the pixels were square. So that means the native resolution was 320x256. While it would be tempting to stick to that screen size and thus have it fit on every smartphone screen, I've decided to double things and target a 640x512 effective canvas. As a tiny nod to the present, the "screen" is actually slightly transparent and has a drop shadow - showing how far we've come in 34 years!